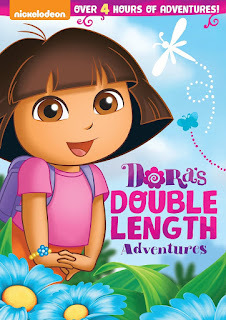 Since I have two boys, Dora is obviously not the first movie they pick out when we are watching DVDs, but it is definitely a show that holds my youngest sons attention when it comes on the television so I was happy to receive the Dora's Double Length Adventure to beat some of the summertime boredom that has bean going on at out house! At less than $20, it make a great summertime birthday gift because it is a must have for any little Dora lover!! You can pre-order this fantastic DVD on amazon, and make sure you get it first!! Most school districts still have a few weeks left of school on the release date of this movie, so make those last few weeks more enjoyable with Dora the Explorer: Dora’s Double Length Adventure!